Labelling something as "shonky science" without giving a reason for it. Correctly rebutting points that have nothing to do with the actual topic: climate science. This is absolutely incorrect. The IPCC is a global panel of climate scientists, their work represents the conservative end of climate science thought. They are not alarmist, they are understated. Then where does one go to for the ethical "science" on this issue? The novels of Ian Plimer and the speeches of Monckton? When Al Gore with his payed UN scientist try to save the world it is always time for be careful. Yet you will probably find one saying that they are too optimistic in the emissions scenarios? Can you give me a date for that quote? ....I hope you've enjoyed the first episode. Why thank you bicing. Now, I'll make way for the top men. Where's the arbiter on this topic? Never mind, there he is. Whom I should trust Al Gore & UN, please dude take a break. I trust local academics who works for 700 euros for month , and says that western UN climate alarmist is nonsense. Please let me choose my trusty dudes. Again Polish Academics also do not trust , call them mate, just call them. Just predictions and non linear models, I believe in ice core Vostok measurement and common sense, others they are just arguing against themselves, not against opinion opposition. So pretty much payed predictions and models in order to put guilty as charge India, Brasil and China . The Polish Academy of Sciences support the IPCC and believe climate change is an important priority. "Problems of global warming, climate change, and their various negative impacts on human life and on the functioning of entire societies are one of the most dramatic challenges of modern times." This quote you brought up was written by a GEOLOGIST, not a CLIMATE SCIENTIST. Many of the points he makes are incorrect. There is extensive multidisciplinary research involving climate change. Oceanography has been around for much longer than 40 years. It is well estaiblished that human activity is the main influence. I had not heard of Vostok before you mentioned it, so i looked it up and found what appears to be its legacy. What do you believe in when you see this graph olbborn? It's saying that there is a very strong relationship between atmospheric concentrations of greenhouse gases and temperatures. "9. There is no doubt that a certain part of the rise of the level of greenhouse gases, specifically CO2, is associated with human activity therefore, steps should be taken to reduce the amount on the basis of the principles of sustainable development, a cease of extensive deforestation, particularly in tropical regions. It is equally important to take up and pursuit appropriate adapting actions that will mitigate the effects of the current warming trend." Nice! I didn't click the link. What be this- contestants awarding themselves points? Other interesting patterns in the Vosok data include the extreme increases and decreases in temperature preceding and following the interglacial phases (the five high temperature phases in the graph or up and down). long before cars dude, long before us. It's also unknown how much of the historical temperature (even from Vostok Ice core) changes have been due to GTGs (green house trace gasses), and how much has been due to orbital forcing, ie, increases in solar radiation, or perhaps long-term shifts in ocean circulation. CO2 would not kill us, it is all natural, just relax and smoke some bong for start. Climate scientists use those very techniques that you attribute as exclusive to geologists. So you're wrong there. Everyone acknowledges that global warming and ice ages have been occurring long before us. There have been an increase in temperatures as a result of the fossil fuel period. So you're wrong there. If you agree with the Vostok data then you agree with anthropogenic global warming. The main point of that research was the positive relationship between carbon dioxide and temperature, and methane and temperature: If carbon dioxide and methane concentration in atmosphere increases, then temperature increases. Human activities generate carbon dioxide and methane, therefore increasing the concentration of carbon dioxide and methane into the atmosphere. The point is, human activity is accelerating a natural phenomena, therefore making it unnatural. You are so wrong and ignorant about this subject. Widely known to be unreliable by whom exactly? Based on what? You made a bold claim there ACF, and it is also a claim that goes to the heart of the issue, about who is making claims we can trust (more) to be (more) right. Who should we listen to (more), and who should we listen to less? So I hope you will give me a thorough support for that claim, please, all the more since the recent incoming data suggest that the exact opposite is true, for their key predictions and current modelling anyway. Since you made the claim that the models are widely known to be unreliable, I kinda hope you will name the IPCC models that the IPCC is paying most attention to, and how their forecast ranges are matching real data so far, with a source for the data on which you base your claim. Specifically, I am dead curious to hear your take on how their (key) claims, across the board, are holding up vs the real data that is incoming (or what/who your sources for those claims are - I suspect you rely on the opinion of others as much as I do). 1) I have mainly argued that some poorly supported claims made by others should have been fact-checked with a bit more rigour by those that dragged them into the discussion, before doing so. On both sides. And that I regret how politicised this debate has become, on both sides. 2) I have made remarkably few claims about what I expect to happen going forwards. Mostly, because I don't know. I rely on others to inform me about this. So it is important that I listen to the right people too, and keep an open mind. Which is one of the reasons why I still look into solid-sounding "new" claims I get presented with, sceptic and not. I have found that some sources have a far better predictive track-record, and comprehensive outlook, than others, so I would be lying if I said that I was paying more attention to the people who, so far, have given me the least reason to trust them. I have not discarded the possibility that I (or the next generation) might end up (happily) surprised. Even if the current figures are not looking good, there is still a lot we don't know. For all I know, we might still trigger processes that we haven't foreseen, and which are thus not part of the current models either. That could work out in both directions, btw. I am curious why you have me down as an alarmist, but I will ignore that easier-to-reject label, and look forward to a post on issues only. Oh, and nice to see you on the site! 1) please tell me you are not so ill-informed that you assume that there is no predictive modelling involved with geology? 2) and it isn't just climate models predictions that we are looking at. We have has several years of actual data, which is as real as the stuff that geologist are measuring. So we are perfectly equipped to reflect on what the models have predicted vs what we have measured. Answer: the constantly improving models have been predicting ranges that we are currently measuring all along. 3) geology is as likely to "lie" as climatology. Both are specialist subjects which are trying to make sense of a subject of which not everything is known yet, with instrumentation that is constantly upgraded. By applying the scientific method. Combining accumulating data, and combining that with informed speculation, proposing a hypothesis, creating theories which can be replicated and/or falsified. Aspects of geology just happen to overlap with some of of the aspects that are used for figuring out how some aspects of climatology work. Geologists, across the history of the subject, also propose theories that haven't been proven yet, expect data that hasn't been measured yet, and base this on informed expectations. You appear to show a misunderstanding of both the science of climatology and geology. Ok, "let's", as this too has been widely covered in the past. 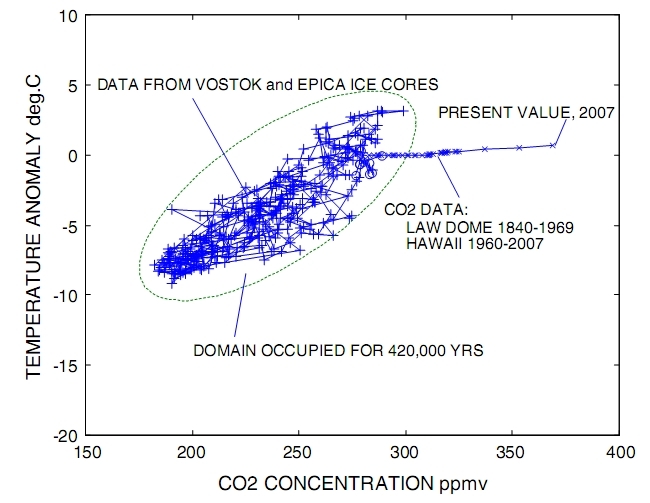 Actually, looking back over 420,000 years, the experts did find that temperature and CO2 concentration were definitely correlated, with a correlation coefficient of 0.86, excluding Law Dome and Mauna Loa data. Although, strictly speaking, we are looking for forcing, not temperature. The 2nd image also screams something else at us: that over the last 170 years, there is an odd shift taking place (as indicated by the line that moves completely outside the settled and related variations and increasingly so). This is so different from the 420,000 years preceding it, that whatever is driving our climate just now, it must be something that is significantly different from all that went before. If you add up all that we know about Vostok, the thing to note is that forcing is higher when our system is in a warm phase. This correlates with earlier findings that suggested the same. Slow feedbacks appear to be the cause. Indeed, as you say, geology (well done) doesn't lie. So you agree then that the Vostok data seriously suggests that we are well outside the natural ranges that were established over the past half a million years. And, apparently, increasingly so? You cannot use the example of Vostok and then ignore what the 420,000 years of reconstructed data are telling us more than anything else. Something that is significantly different over the last 170 years compared to the previous 420,000... now what could that be? EDIT: Rather than engage me on issues, I see that you have suddenly insinuated that I "follow" my "leader" Al Gore, a couple of times even. Seriously? It means that you have not understood a single word of what I have actually written, and stressed over and over, about the importance I place on preferring to listen to qualified experts, rather than politicians. If you want an honest debate, at least respond to what I actually write, rather than put words in my mouth and (try to) slam me down with arguments that were never made by me, but invented by you. It seems a bizarre path to take, given the amount of times I have made it clear that folk like Al Gore don't mean much to me, given the amount of genuine expert opinions that are easily accessible these days. Hey take a read: "the time lag of the rise in CO2 concentrations with respect to temperature change is on the order of 400 to 1000 years during all three glacial-interglacial transitions." in simple words 100 years (my country is still in industrial revolution ;D) few cars and chimneys are just that "nonsense" IMHO, too short period to happens anything. 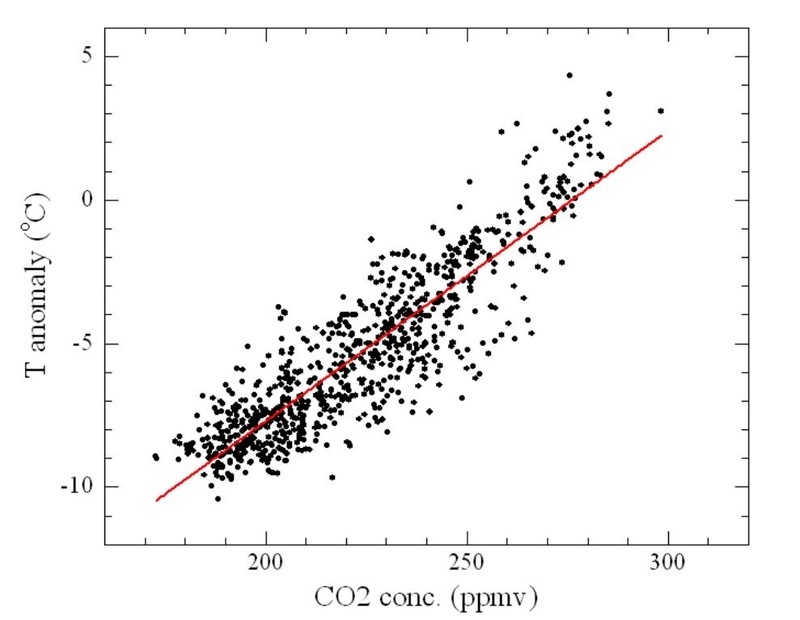 Of course there is possible relation between CO2 and temp rising, but what kind? Temperature rises first, and then comes an increase in atmospheric CO2. Or, CO2 remains essentially unchanged while temperatures drop. Or, CO2 drops while air temperature remains unchanged or actually rises. 1) please tell me you are not so ill-informed that you assume that there is no modelling involved with geology? 170 years is nothing my friend, nothing. We are talking about zillions of years here. Zillions, is there such a number? I would prefer it if I was kept out of that. Although there might be something to be said for keeping track of claims made/claims refuted, it's not really how I'd like to engage others, even if I disagree strongly with them. ACF, please jump in, as at least I know you can argue honestly held beliefs honestly, like why you think that fringe-theories like "Cadel can win a Tour" might be worth listening to. The staff of this organisation are the Idso Family. They are funded by coal, mining and oil interests, receivng over $1 mil in total. They have been quoted as saying the organisation is "so poor" yet their tax records show a satisfactory bank balance with about 2/3rds of it going to the salary of one of the Idso family members. Here we see EVIDENCE that skeptics are being funded in a corrupt way, where is the evidence that Al Gore and the IPCC are doing this? Your imagination and fake-science-experts don't count. 420, 000 really matter dude , but not 170 that was my point. Zillions was just metaphor. We should talk about zillions if there is such a deep ice core, but there is not, they only drilled how much 3000m or so? Aye, mine was too. My point of contention is that contestants can't be the arbiters (bar the arbiter). And what is wrong with coal, mining and oil industry again? This isn't about debate at all for you, is it? Has it really taken you this long to figure that out? The problem with not reading is that you keep asking questions, issues and problems (from 2003), which have answers (from 2012) which are already given, in posts above you, and in links before this one. And which are in posts about as long as the one you quote, so spare me the "it's too long" nonsense. Or do you only read long stuff when it suits you? They have a vested interest in a world free of CO2 mitigation, just like there would be outrage if a "pro-CC" group were funded by the owners of CO2 mitigation technologies.